I’ve studied about Avalon for many years, and I finally am able to visit it, at least in the form of Avalon on Catalina Island. I’ve learned today much about the island’s fascinating history, so much that it will require several entries to do my adventures justice. I decided to catch up on entries of my trip by showing some photos and making brief comments on each. 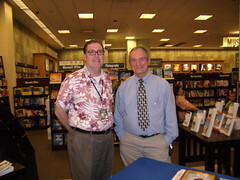 First of all, here is a photo of me and Lou, the CRM at the Barnes & Noble in Palm Desert. He is a fine manager, all business and when he saw I was all business too, we got along well. I have a definite invitation to return. He and his staff were sharp and supportive and my signing there last Saturday would have to be one of my favorite author events. 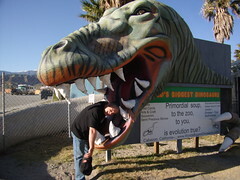 Here are some photos taken at Cabazon, on my way from Palm Desert to Los Angeles. 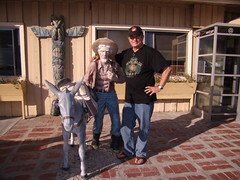 The first is of me, posing with a gold prospector outside the general store and restaurant in the small town. As my relic hunting addiction would suggest, I’ve always wanted to search for gold. Behind the restaurant was a gift shop, but this shop was unique in that it had HUGE dinosaurs constructed, sculptures created by the famous Claude Bell of Knot’s Berry Farm. 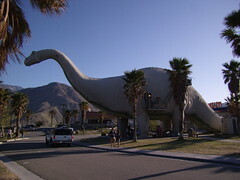 For example, here is a Brontosaurus (more correctly, an Apatosaurus).